You can put an end to sleepless nights that can make your back pain worse by changing how you think about sleep and pain using CBT techniques. Do you regularly find yourself staring at the ceiling in the middle of the night when all you want to do is be able to sleep? If you do then this is bad news. Because getting a good night's sleep is crucial for both your physical and mental health and well-being. However, it can remain elusive for people with chronic back pain. For instance, one study of people with chronic lower back pain in Morocco found that a whopping 78% of them said they were suffering from some kind of sleep disorder. So there's a good chance you'll understand what I'm talking about here. Working to reduce your pain levels during the day so you are more comfortable at bedtime. Improving your sleep hygiene to get into good habits. And changing your behaviours in the lead up to going to bed so your body and mind are relaxed. I've written about how you can do this in detail here. However, there is one more factor that could be causing your problem and that is how you think about sleep and the effect your pain will have on it. Because people with insomnia can hold negative thoughts, attitudes and beliefs about being unable to sleep. And this can be a major barrier when it comes to being able to get to sleep and maintain it throughout the night. Why Does How You Think About Sleep Matter? People with insomnia and back pain thinking negatively about their inability to sleep is hardly surprising. As it’s hard to be positive about something you have a problem doing. However, these thoughts will only make it even harder to sleep. For example. recent research by the University of Warwick has found that chronic conditions such as back pain are directly linked with people having these negative thoughts about sleep. And the people who believed they wouldn't be able to sleep because of their pain were more likely to suffer from insomnia. So when trying to treat your insomnia you also need to examine what's going on in your mind. But why do negative thoughts about sleep make it harder for you to drift off? They heighten your emotional responses to sleep disturbances, making you feel anxious, angry, and frustrated by them. You become more aroused in both your mind and body before sleep, and when your mind is whirling and your body is alert sleep is going to be a problem. They lead to people adopting poor sleeping practices and not taking enough care to manage their pain. And all three of these factors will have a major effect on your ability to sleep well. But the problem is that these negative thoughts can become so ingrained in your mind that they become automatic. So you probably don't even realise that you're having them. However, when you do become aware of them and look at them closely they rarely turn out to be accurate. And in most cases by applying some logic to them they can be challenged, disproved, and reframed in more positive ways. Which will help you to feel more relaxed and give you a far better chance of getting off to sleep. And the best way to do this is by using CBTi techniques. What Is CBT For Insomnia? CBTi stands for Cognitive Behavioural Therapy for insomnia and is all about to identifying negative thoughts that make it hard to sleep, challenging them with evidence and logic, and reframing them in a way that more positively and accurately describes reality. By doing this you can lower your stress and anxiety levels, making it easier to relax. Which in turn will make it much easier to get to sleep. For instance, CBTi has been found to be a very effective treatment method for between 70-80% of insomnia patients. Also in a review of five studies by the University of Pennsylvania into treatments for insomnia it was found that treating patients using CBTi methods was more effective and longer lasting than treating patients using sleep medication. So it can work even better than taking sleeping pills! Because unlike the short-term relief of taking pills, by changing your attitudes and thoughts about sleep you can find a long-term solution to insomnia. And this will also help you to cope better with your chronic pain. Identifying your negative thoughts and beliefs about your ability to sleep and the effect your pain will have on it. Challenging these thoughts using evidence, knowledge and past experience to see if they're true or not. And using that to reframe these thoughts in a more positive, accurate and healthy way. And I'll take you through how to do each of these stages now. If you are going to change your negative thoughts and beliefs surrounding your ability to sleep then you firstly need to become aware of them. As they can become so automatic that you may not even realise you are having them. But in order to be able to challenge them and reframe them in a more positive way you need to make sure you become aware of them as they happen. And this is where keeping a sleep diary can be a helpful tool. As by consciously writing down your thoughts and experiences each night you can identify any deep-lying negative thoughts and attitudes that would otherwise remain undetected. How many hours of sleep did you get? How many caffeinated drinks did you have during the day and at which times? What were you doing in the hours leading up to going to bed? How did you feel when you woke up? How did you feel during the day? Which thoughts were going through your head as you tried to get to sleep? What are your main worries about not being able to sleep? How do you think this lack of sleep is going to affect you the following day? Which emotions are these thoughts creating in you? Are you feeling angry? Anxious? Frustrated? By doing this for a couple of weeks the benefits are twofold. Firstly you will be able to see if there is a link between your behaviours during the day and your sleeping problems at night. Which will give you the chance to correct these behaviours and replace them with better habits that will encourage you to sleep easier instead. Secondly it will make you aware of which thoughts and emotions are whirling around in your mind as you struggle to get to sleep. So make a list of all the negative thoughts that crop up in your sleep diary over the course of a couple of weeks. And then you're ready for the next step which is to challenge them. Now unfortunately you can't stop these negative thoughts from occurring. However, you can learn to disrupt them. So once you become aware of your negative thoughts and attitudes towards sleep and the effect your pain will have on it they can be challenged. And you do this by looking at them in detail and seeing just how accurately they represent your sleep problem. Because you'd be surprised at how often your brain can trick you into thinking things that​ are simply not true. And this makes it all too easy to get stuck in ways of thinking that are exaggerated and unhealthy. But by gradually changing how you think about the relationship between your pain and sleep, you can get a more balanced view of reality. Which will leave you feeling more relaxed, hopeful, and in control rather than stressed out, angry, and frustrated. So challenge your negative thoughts using evidence and knowledge that can disprove them. In this way the more knowledge you have about your experience of insomnia and chronic pain the easier this is going to be. ​And the good news is you've already made a start without realising it! Because by reading through articles online and speaking to professionals you can gain an understanding of why insomnia occurs and what you can do to prevent it. And how your pain might be affecting you. It's this greater understanding that will give you the knowledge you need to realise just how irrational and false most of your negative thinking is. So once you're armed with this knowledge it's time to reframe those thoughts in a more positive and realistic way. Now you have a list of negative thoughts from your sleep diary and have armed yourself with a wealth of knowledge on insomnia and the effect your pain has on it. But how do you go about reconstructing them? One way to do this is to go through them one by one and replace them with a positive coping statement. A coping statement is a more positive, rational and healthy way of thinking about sleep and pain than the negative thoughts you are currently having. And doing this can relax you and put you in a healthier frame of mind, which makes it easier both to fall asleep and to cope with your pain. So make an attempt to change both your false beliefs about your insomnia, and also the negative thoughts about your pain and it's effects on your ability to sleep. Many negative thoughts about sleep fall into the categories of false beliefs or catastrophic thinking. And both of these are unhealthy when it comes to getting to sleep or dealing with your pain. Now having this thought whirling around in your mind is only going to make you worry. Which will arouse your nervous system and make it even harder to get to sleep. But look closely at it. Think back to all the times when you’ve had trouble getting to sleep in the past but still managed to make it through the following day. When examined through this lense the thought doesn't stand up to scrutiny. ​With this thought in your mind instead you'll be much more likely to relax enough to drift off. This thought will only make you feel helpless and frustrated. However, it's a ridiculous statement when you really look at it closely isn't it? I mean you may be struggling but you're not going to be up all night are you? As you always fall asleep eventually. Just this simple shift in thinking can quieten your mind and relax you enough to have a far better chance of falling asleep. So go through each of your negative thoughts about sleep and change each one in this way. Unfortunately those of us with chronic back pain can have an additional problem when it comes to insomnia. As we can become preoccupied with the effect our pain will have on our ability to sleep. Now being in pain does affect your ability to sleep, and it's a good idea to get into good habits during the day that can minimise the amount of pain you feel come bedtime. However, this pain can also lead to catastrophic negative thinking that will only make your sleep problems worse. How is this going to make you feel? Hopeless? Despondent? Helpless? It's certainly not going to help you get to sleep is it! But again when examined closely is it really true? Because while pain does impact on your ability to sleep, there are loads of things you can every day to try and reduce your pain. ​By thinking this way you'll have a far more positive outlook towards your ability to sleep. And it puts you back in control and makes it more likely that you'll manage your back pain in a more healthy way. Which will greatly improve your chances of sleeping well. So can you see the idea here? The first thought in each example would create frustration and helplessness at your inability to sleep, leaving you feeling angry and stressed. While the positive coping statement you replace it with will put you in a more hopeful frame of mind. Giving you a greater sense of control and autonomy which will help to relax your mind and body and make it easier to sleep. So go through each of the negative thoughts in your sleep diary and challenge and reframe them in this way so they more accurately reflect reality. While challenging and reframing your negative thoughts is a great thing to do, it can be a difficult process. As old habits die hard. And this is especially the case with thought processes that may have become automatic. So for this change in thinking to occur you need to work at it. As positive coping statements need to be repeated over and over again until they become automatic in your mind and override the negative thoughts. And in time your brain will use these positive beliefs to replace the negative thoughts. The result of this is you will worry less, be less anxious, angry, and frustrated, and have a far greater chance of getting a good night’s sleep. And my favourite technique for doing this is to use flashcards. As these are a great way of memorising things for exam revision and they can work just as well for getting those positive coping statements into your brain. So write down a negative thought on one side of a flashcard and on the other side write down the positive coping statement that replaces it. Now do this for each and every negative thought about sleep and pain that you have in your sleep diary. Then keep these flashcards handy and when you are struggling to sleep have a quick read through them. As through repetition your brain will learn to associate the positive coping statement as the counter for the negative thought. And hopefully over time this will not only lessen the frequency and power of these negative thoughts, it may even replace them completely. Now I've given you some basic Cognitive Behavioral Therapy techniques for insomnia to try out here. But if you want to go further a book I'd recommend getting is 'Overcoming Insomnia And Sleep Problems' by Colin Espie. 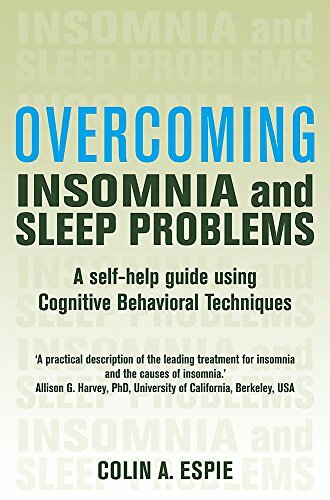 As this book is written by a well respected expert in the field of overcoming insomnia using CBTi techniques and contains a detailed 6-week self-help course that you can follow. Which judging by the reviews has worked well for lots of people already. So take the 6-week challenge and see if it makes a difference to the quality and ease of your sleep. Being able to get a good night's sleep is so important when you suffer from chronic back pain. Because it's during sleep that your body gets a chance to heal and repair itself. So when this sleep is disrupted it can cause a multitude of health problems, including an increase in the amount of pain you feel. And unfortunately sleep disorders are increasingly common among people who suffer from back pain. Managing your pain well during the day. Getting into good sleeping practices. Changing your behaviours in the lead up to sleep. Challenging and reframing negative thoughts about sleep in a more positive way. And in this article I've focused on the latter. As using CBT techniques will be a massive help in overcoming your insomnia. But whichever way you do it, working on the mental side of insomnia alongside changing your behaviours during the day will give you the best chance of beating it for good.